Love to see the wrap up of this one. my 1987's are sorta in the 70-72ish spec everywhere but the preamp I leave the 33/33. Hi, yeah I love that 32/32uf on the preamp as well. I pretty much have it on every amp, it just seems to feel right. And your right I definitely need to wrap this up now its done. I kinda got so far and then was waiting for ages on the iron then when it turned up work went mad so its taken forever but it's all good now. So this one went through a bit of a change in direction. 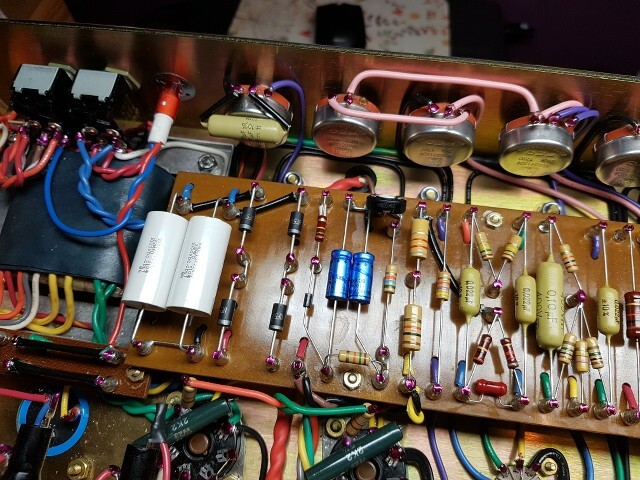 I decided to build another 50watt 1987 to replace this one and with the help of every one (especially a big thanks goes out to Dave Weyer) over on the 6550 Experience thread under the Hendrix related topics section I modded this amp to West Coast specs. So I asked Dave if they ever did the mod on a 50w (not for Hendrix, his were 100's but just in general) and he said yes they had so that was it decision made. Dave had said 450v on the plates of the output tubes should do it so I had to do a shuffle round on the iron. I took the ****** Iron I had for this one and put it aside for the next build. 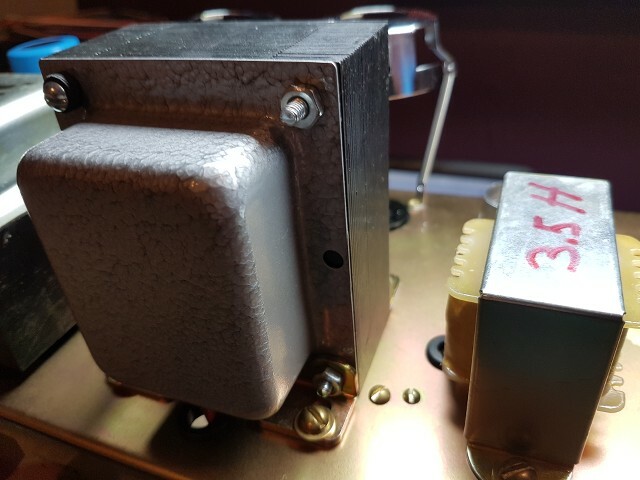 To achieve the 450v on the plates I went with a Classic Tone P.T 40-18054, I then ordered a Marstran 784-139 O.T and used a ****** 3.5h choke I had spare, I actually ordered a 5h choke with bell covers for my 2203 build but the 3.5h without bell covers showed up but it worked out O.K as I used it for this build. When I got the O.T I thought I may have received the wrong one because it has the RS style hammered finish on the bell covers but after contacting Brian he confirmed from the wire colours that its definitely a 784-139. Brian was great to deal with so I can definitely be added to the list of +1 for Marstran, I actually really like the finish but most of all It sounds really, really good. (Thanks Brian). This is the Classic Tone P.T, I only realised when I received it that it has taps for 220v and 240v and I'm operating on 230v so This could potentially be a problem. I was mostly worried about the heater voltages so my plan was to go with the 240v tap and put resistors in line with the heater wires to bring down the heater voltages. I got that Idea and help from the guys over on the 6550 Exp thread so thanks to everyone for that. This P.T doesn't mount so the laminates have direct contact to the chassis, instead it is spaced off with 4 nuts. I guess this is part of the cure for over heating, It looks a little strange compared to what I'm used to but as long as it does the job and doesn't over heat I'm not too bothered. 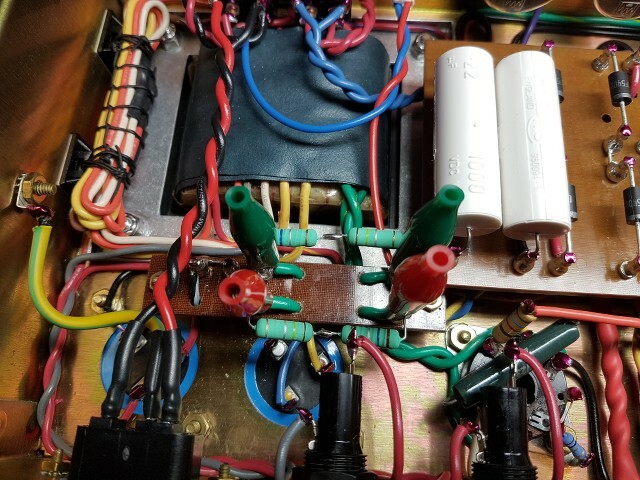 This P.T also has wires that come out of the P.T instead of a tag board and different connections can be made to achieve the desired output voltage. so my plan as you can see was to install a separate little tag board so I could use this to link out the core for 240v and split the heater wires and experiment with different value resistors till I could achieve the 6.3vac for the heaters. So here's the really strange thing, so I'm running 230vac wall voltage, I changed my mind and decided to see what happens if I hooked up to the 220vac tap instead of the 240vac and I'm getting 460vdc on the plates so I'm clearly thrilled about that but as it is I don't need any resistors on the heaters because its kicking out a perfect 3.15vac on either side of the heaters so I'm getting 6.3vac across the heaters. So all in all I'm really happy with the Classic Tone for this application and the heater voltages are the best out of all my amp's. 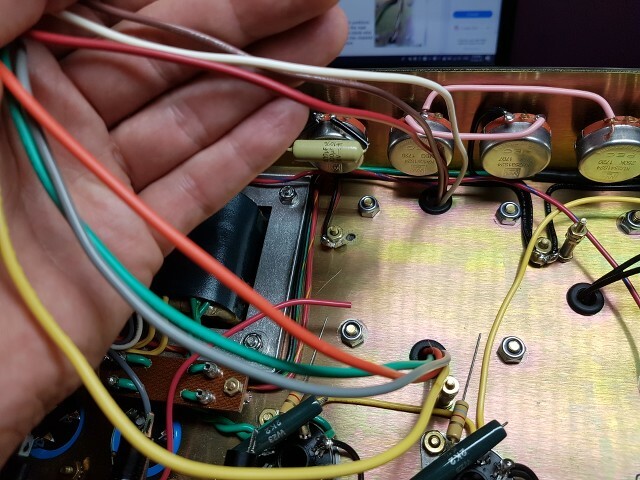 I have now soldered in two wire links across the heater wire connections on the little tag board and the wire's are insulated. It has also made for a handy little spot to wire in a 6vdc indicator lamp as the 120v tap will be no good with the higher voltage out put now on it. Here you can see the two 2.2k 10watt wire wound Welwyn resistors wired across the screens. This was a big part of the mod to save the valves from over disapating and going into melt down with the high voltage applied to the plates. I'm also told it adds a bit of squish at higher volumes which in theory sounds great for the 6550's. Beautiful build you have there Revolver! I can'tfind the thread but the question was asked awhile back about whether the PT should be mounted flat to the chassis or with the nuts in between. A very well known boutique builder (can't remember who) joined in and said that he always removed the nuts and mounted the PT flat to the chassis and has never had any problems. 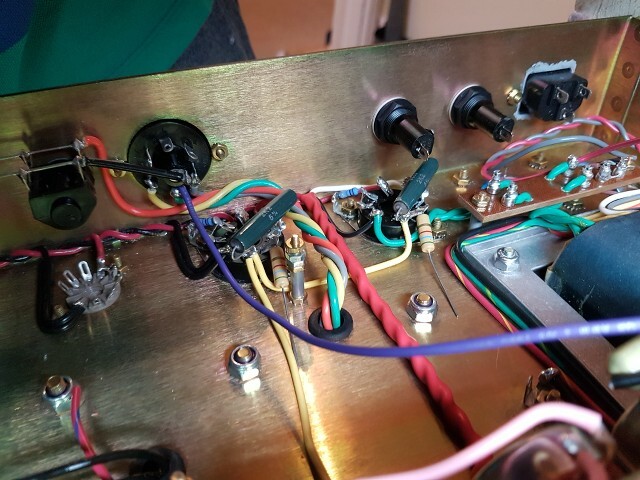 I believe that Classictone recommends not to remove the nuts but I have done it both ways and have never experienced any issues. Thanks for the kind words Danman. That's a good piece of info there, I went with the nuts on purely because it said to do it that way on the leaflet that came with it but it does look a bit odd. I guess it cant hurt since I'm running it on the hot side. 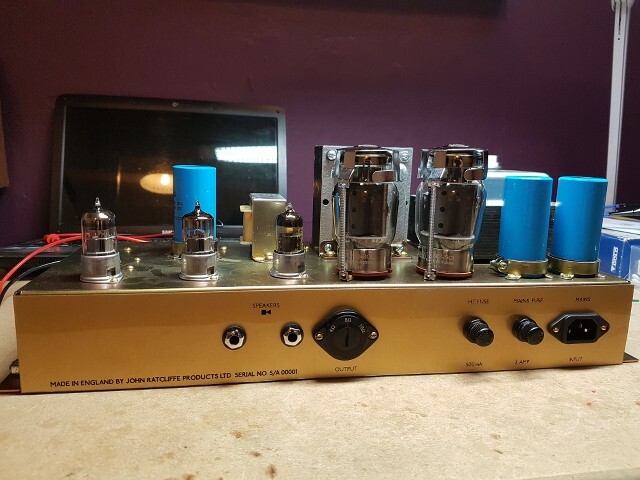 I had some NOS RS caps fitted for the snubbers on all my amps but after only a couple of power downs on one of the amps one went bang So I ended up going through all my amps and pulled the RS caps and replaced them with current production caps. I also had NOS Tesla electrolytic's in the bias circuits with an old NOS trim pot. 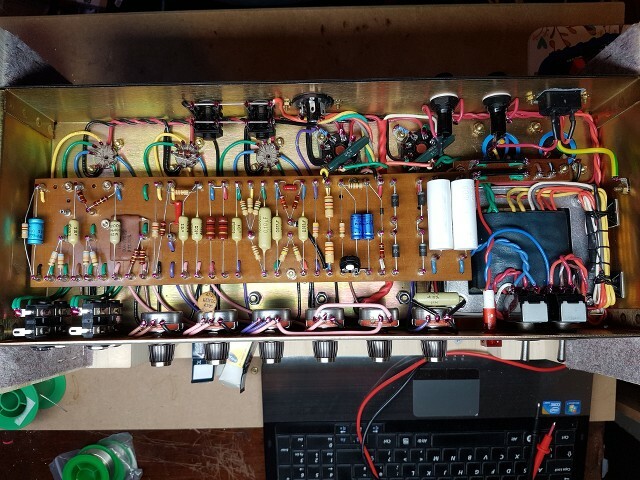 On the first amp I went to bias up the range wasn't giving any adjustment so again I went through every amp and replaced the trim pot and electrolytic caps. The NOS stuff looked cool but reliability is really more important especially as far as the bias is concerned. Another part of the mod is to run the 6550's on an idle current of 25ma, this obviously runs the 6550's really cool and further into class B operation which again is a part of the sound (sounds like a bit more gnarly type of over drive). So I had to play around with the value of the bias range resistor to get the bias in range. (For any one who doesn't know, the bias range resistor is the one between the electrolytic cap and the trim pot). When I first fired it up I used two of the new current production TungSol 6550 and it needed an 82k range resistor but when I dropped the NOS TungSol's in I had to change that to a 56K. I ended up putting two turrets in there and hard wired a wire link, one from the bias electrolytic cap and the other to the trim pot so now I can change that resistor in and out as needed and it won't disturb the wire jumper under the board or show extra heat to the cap or trim pot. Oh, and I also went with two 150k resistors in the phase inverter rather than the two 220k used for EL34. 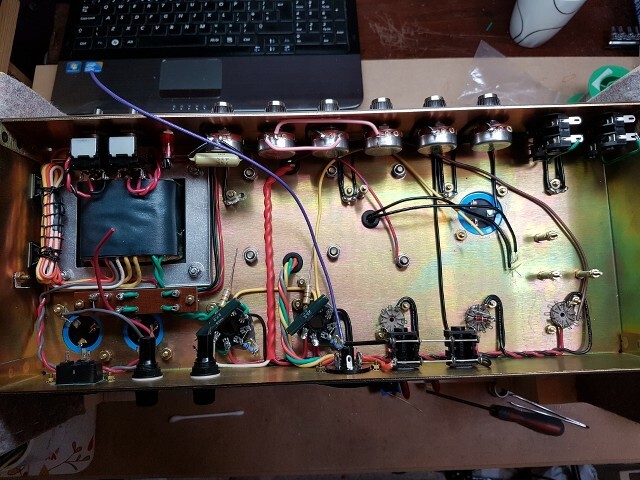 Most of the guys in the 6550 Exp thread didn't go with that change, as far as I could make out they left it alone because no one had seen photographic evidence of a modded Hendrix amp with this change. I went with the change to extend the life of the tubes mainly because they were so damn expensive. Not sure what the difference in sound would be, I'm sure there probably is some difference but tube life swung it for me. So The final change's for the mod were to go with shared cathode on V1. I then removed the .68uf cap and 820k resistor I had in there from when I was going to go with split cathode. High voltage Power Transformer giving 460vdc at idle on the plates. 2.2k 10watt wire wound resistors on the power tube sockets. 6550 power tubes run at 25ma at idle. Achieved range with 56k bias range resistor. (Also used a 150k for the bias input because of the 6550's). Two 150k resistors in the phase inverter instead of 220k. No .68uf cap on V2. 470k resistors on the mixers with a 500pf silver mica cap. 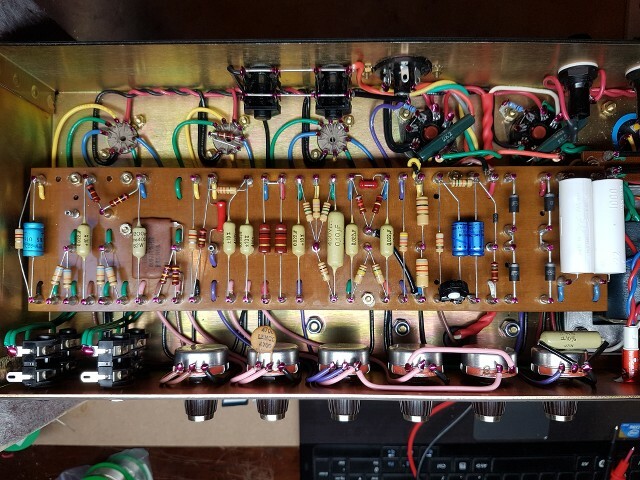 33k slope resistor with a 470pf dog bone on the tone circuit. 47k negative feed back on the 8ohm tap. 4700pf bright cap on volume 1 pot. I also used DPDT switches because of the higher voltage handling and had to bend up the tags on the bottom of the switches to avoid contact with the P.T. And I fused the live rather than the neutral. I went from the IEC connector straight to the mains fuse carrier and then away to the switch for safety purposes. You can see in an earlier picture although I fused the live I went to the switch first and then the fuse but I changed this to go to the fuse first. The Picture above shows the RS snubber caps before I changed them out. One thing I forgot to mention I had 2x 8.2k 2watt resistors for the pre-amp droppers, I changed one out to a 10k 2watt like a Superlead. Dual 50uf for 100uf on the mains. Dual 50uf one half for screens and the other for phase inverter. 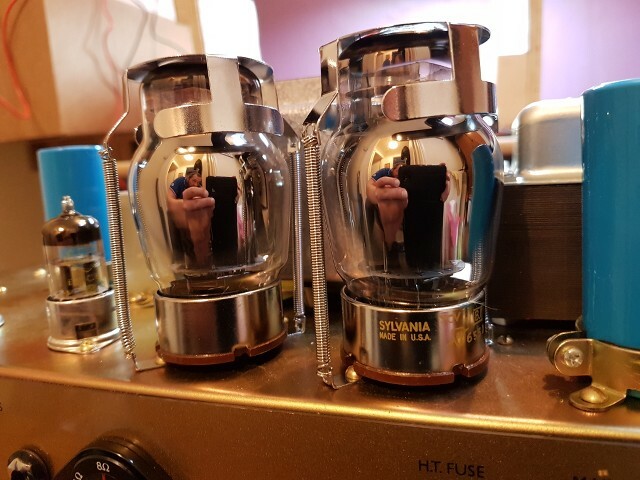 Dual 32uf on the preamp. So the verdict... Love it! I put it through an oversized 2x12 StoneAge cab with 1x 75HZ and 1x 55HZ Scumback and it sounds really, really good. 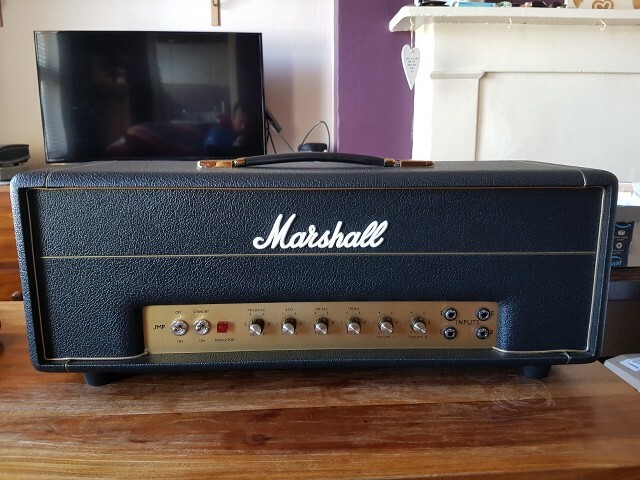 I then put it through my other over sized 2x12 StoneAge cab that at the moment has 1x Celestion Marshall V30 and 1 Celestion G12T75, these speakers aren't even broken in yet and it still sounds great. 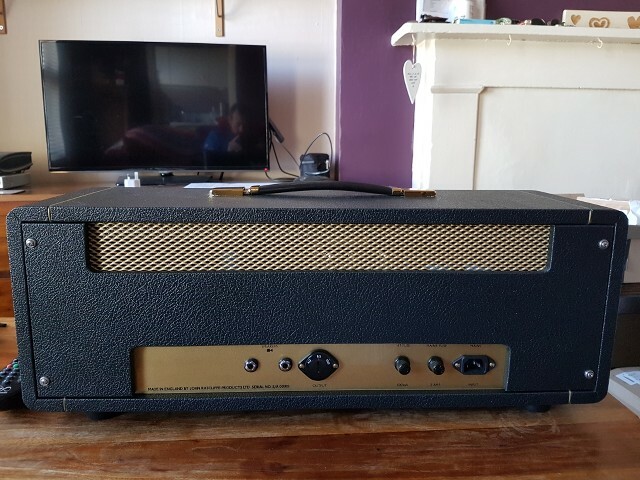 The only draw back to make an assessment of its Hendrixy quality is that I have had to start from scratch with my whole rig guitars included and as such I only have an R8 to test with at the moment. Its big and thick very dominant/powerful sounding, quite aggressive as well. The 6550's aren't stiff at all like I was expecting. It really is a very usable amp and I cant wait to explore it more. I have issues with the neighbors so I'm looking to get it stored at a studio so I can use it whenever I want. When I first tested it had the 4700pf bright cap wich to be honest sounds pretty cool probably better with the scumbacks though which makes sense. I have now swapped a 100pf RMC disk cap in to try which I haven't herd yet and after that I will try a 2000pf Lemco dogbone and decide which I like best. The only other thing I would add is if I was specifically chasing the BOG Hendrix thing I would probably choose a silver mica in the tone stack because I think the dogbone gives the drive a more aggressive edge. I'm digging it the way it is at the moment because it makes it completely different to my other 1987. I'd say the way it is right now with a Les Paul it sounds very similar to Riot, it definitely has that character about it. 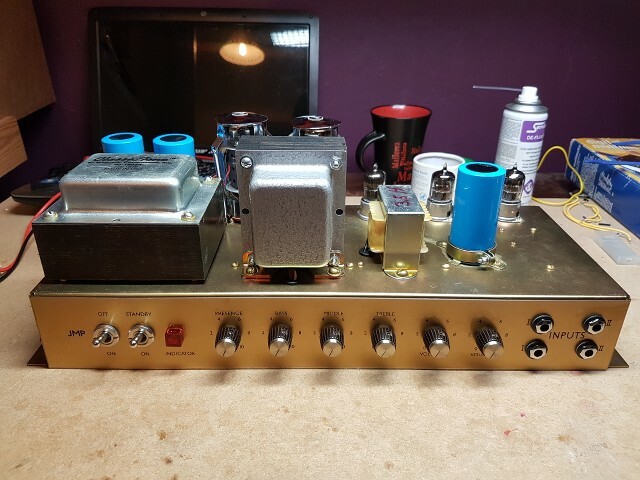 I like it allot just the way it is, its definitely a very useable amp but the goal was Jimi Hendrix Band of Gypsies tone hence "West Coast mod" but it's not really a fair assessment to test it with anything but a maple neck stratocaster. I'd like to get to the bottom of that BOG tone but it may well go back to the way it is now because it absolutely rips. I've never played 6550 before so I didn't really know what to expect from other people's comments. I was initially thinking 100k on the 4ohm tap negative feed back but I don't think it needs it. In this set up it really isnt stiff at all like I expected and it's not harsh or cold either. It's quite a subtle difference between EL34 and 6550 I'd say 6550 seems to sound just a bit bigger, frequency wise it's just a bit wider or firmer/solid sounding very punchy. Send me the inspection tag so I can initial it.